Glenn Apiaries is lucky to be located next to the Welburn Gourd Farm on the historic Garnsey Ranch in De Luz Canyon, near Fallbrook, California. This is an organic farm, so it is very bee friendly, providing nectar and pollen without risk of poisoning the bees with pesticides. 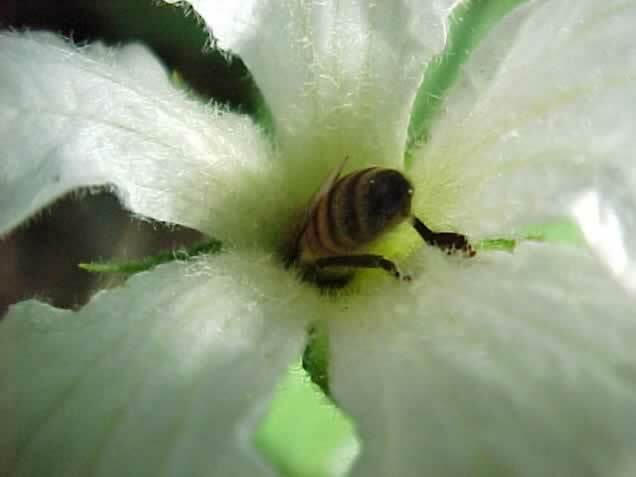 The bees help pollinate the gourds, but they are not only the only pollinators involved. The flowers of this Cucurbitaceae species open about sunset and close in the morning. So the bees start working the flowers late in the day and again early in the morning. But during the night pollination is done by moths and even bats, so this plant supports a wide diversity of pollinators. The Welburn Gourd Farm produces hundreds of thousands of gourds every year. These gourds are used mostly by artists and crafts people around the world who produce the most amazing pieces of art. There must be something about the many unique shapes of these gourds that releases people's creativity. The bottom picture is an example of one of these inspired artists whose work was on display during one of the International Gourd Art Festivals held at the farm.